The Rajputana Museum as it is significantly named, has in its galleries important exhibits from almost all the princely states. There is a library attached to his museum, which contains rare books and important historical publications. Built in the 7th century by Ajaipal Chauhan, the fort gives a bird's eye view of the city. 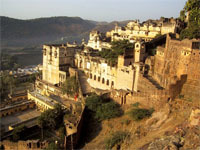 Taragarh Fort or the 'Star fort' is situated on a hill and to reach there, one has to take winding bridle path. Pushkar is an ancient city and has seen history being made since the Ramayana period. The account of this city can be found in the 4th century writings of the Chinese traveller-- Fa-Hien and also in the scripts written during the era of Muslim invasions. 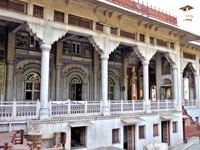 The city is considered by Hindus to be one of the most sacred places in India and has, perhaps, the only existing temple in Asia, dedicated to Lord Brahma. 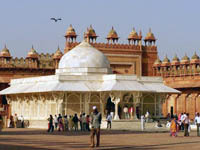 Ajmer presents items, which carry the Rajasthani fervour and reflect ancient mood of the area. One can purchase here amazing old silver jewellery with designs of a totally different era. The annual Urs gives an opportunity to bargain some of the intriguing and colourful items of the region. By Air The nearest airport is that of Jaipur. The state transport has its bus services from all over Rajasthan and also from Delhi. However, during the Urs, large number of people arriving in Ajmer, it is advisable to plan your trip in advance during this time. 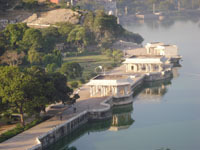 City bus service operate in the city and to Pushkar. Unmetered taxis, auto-rickshaws, tongas, and cycle-rickshaws are also available for commutation. 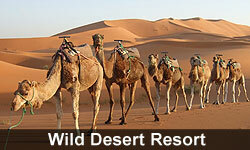 The RTDC has done a lot to retain the traditional flavour in its hotels in and around Ajmer. Hotels like RTDC's Khadim, come with AC Deluxe rooms as well as ordinary rooms, which give a comfortable stay in the city. There are also Sarai facilities for the pilgrims. The government sponsored paying guest scheme makes the visitor feel at home.